Teyla scowls at me from the back seat, obvious annoyance in her voice, her eyes one roll away from Big Trouble. I’m exasperated. But not surprised. My Facebook feed is peppered with children who presumably love Jesus songs, kids who soak up God like natural sponges. Read the rest over at A Deeper Family, where I'm honored to be guest blogging today. Sharing this feels very personal to me; my prayer is that it will encourage other parents who are in this same place. 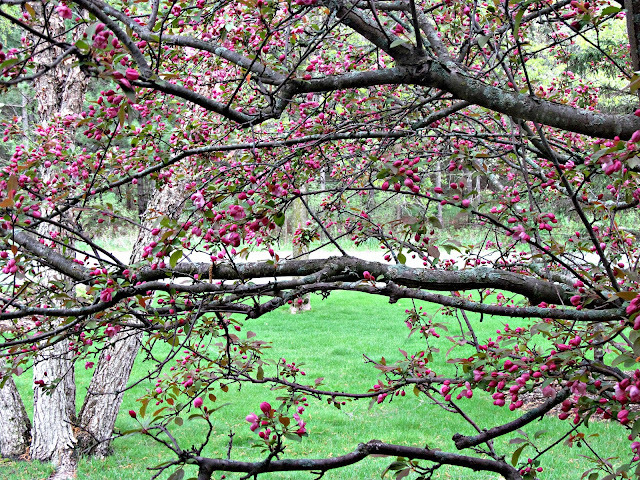 A crabapple tree filled with ready-to-burst buds. The final two weeks of school before summer vacation. The click-click-whoosh of the gas burner firing at dinner time. The sizzle of turkey burgers on the grill. The forecast for a sunny weekend. Reading to my kids at bedtime. Loading the car for a trip to the lake. The smell of chocolate cake baking. Anticipation is one of my favorite emotions. In my late 20s, when I was fried crispy by TV news but not yet ready to leap into having babies, I taught high school for a year and a half. I was, perhaps, one of the worst teachers in the history of the world. I had no training. No curriculum. No clue. What I did have was a love for my subject (media arts) and a love of teenagers. But I quickly discovered those two things aren't enough. It's like trying to fight a war equipped with a Nerf gun and a sunny disposition. To say it was a miserable period in my life would be an understatement. I cared for my students, but I had zero control of my classroom. I cried a lot, and my students watched The Matrix a lot, and we all muddled through together. By the time we got to the end of school that first year, I was in a perpetual stupor. I spent a lot of time staring catatonically out the window, counting the seconds until summer. On the last day of school, I found a note on my desk. It was written by one of my upper-level, video-editing students. A thank you card. In it, Grant acknowledged that the toughness of the year, but he thanked me (THANKED ME!) for sticking it out. Then he wrote down a bunch of memories he carried away with him, funny moments, afternoons spent in the editing suite adding crazy effects to the video yearbook. He recorded them, he said, because he didn't think I would remember them, what with the haze and all, and he wanted me to know I was appreciated. That I had made a difference in his life. I put my head down on my desk and sobbed. I got a few other teacher gifts that day: a gift card to a movie theater, Starbucks paraphernalia. But that card? It was my treasure. I tell you this story, not to tell you teacher's don't appreciate gifts, because they do. They love getting Starbucks cards and gift certificates for the local garden center and they love homemade bread and spice mixes and boxes of school supplies for next year's classrooms. 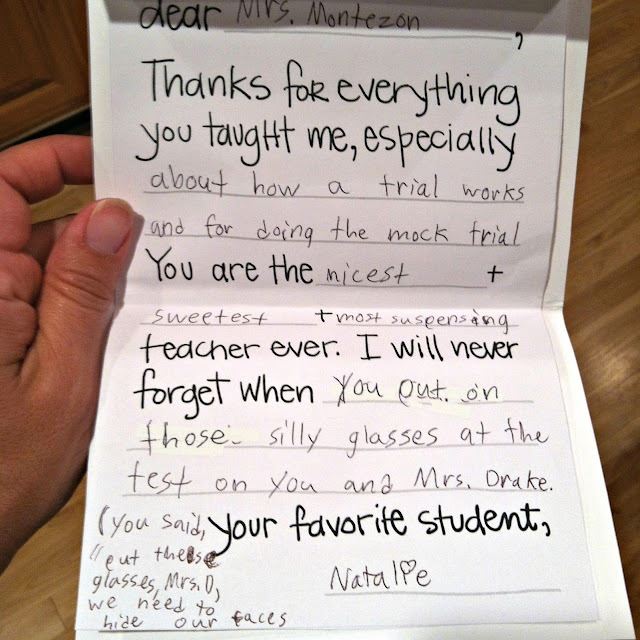 But what your child's teacher would love more than anything is a heartfelt thank you. Enter this free, printable, fill-in-the-blanks teacher thank you from Lil Blue Boo. All you need is some card-stock weight paper and a color printer. Natalie used these last year to make year-end gifts for her fifth-grade teachers. She filled in the blanks herself, but if your child is younger, you could certainly get them to dictate the answers to you. 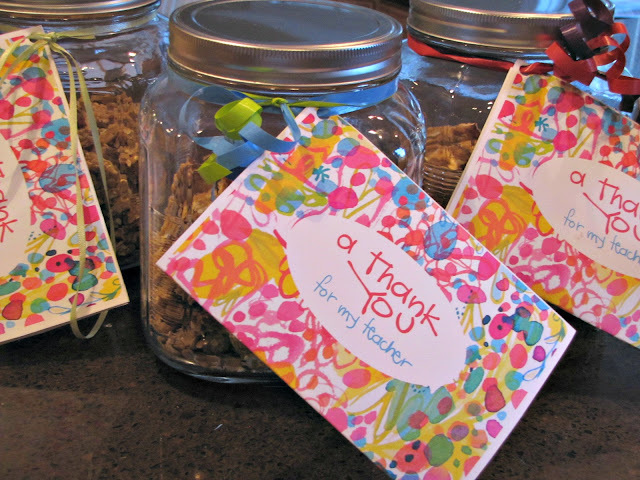 We attached the cards to jars of homemade granola, as you see above, because we wanted to add a personal touch. But while the granola was appreciated, I bet it was the note that was most prized. We can't say thank you enough. Looking for other ideas for teacher gifts? This is a cute way to package a coffee shop gift card. And I love this for a restaurant gift card. Or you could get some tumblers and stuff them with instant drink packets AND a personalized thank you, like this. Or surf Pinterest for more ideas. You know they are out there. Just promise me: no apples. Something clicked in my head as I wolfed down the second large slice of pie, and I saw myself with sudden, horrifying clarity: I had lost control. The long winter wore me down. Desperate for a bright spot, I used food to get me through. Another cloudy day? Let's stop at the donut shop for an apple fritter. Another six inches of snow? In April? Let's bake cookies and pretend like we still enjoy being cozy. Another week of highs in the upper 30s? Pass the Peeps please. I was dulled, deadened to the gradual relaxing of self-control. It wasn't until that night in early May when I ate almost a fourth of a pie in one sitting that the alarm bells sounded. WHAT ARE YOU DOING? Why are you eating so much sugar? Why aren't you making better choices? What about moderation? I wasn't in charge anymore. I was numb to the food in my mouth, eating because "I deserved it" or the kids were finally in bed or I had nothing else to do. My usual standard of one treat a day had relaxed to two treats a day to a treat at each meal to french fries are a vegetable, right? And I could feel it. I don't struggle with weight much, but the pounds were creeping on. I was lethargic and bloated and my back and neck hurt from poor posture. I was over-indulged, in body and spirit. Drastic change was needed. A reset. I needed my body to reacquaint itself with hunger, to remember that dessert isn't a basic human right. I needed to control my appetites, not the other way around. So the day after Kieran's birthday, I went cold turkey and cut three things out of my diet. As far as I know, I'm not gluten sensitive. But I decided to take a gluten-free approach to this. I'm not eating wheat, which means I'm not eating any bread or crackers or baguette or most (sob) cereal. I am allowing myself non-gluten, whole grains. For example: Seeds of Change organic brown rice and quinoa, which I buy at Costco, has become my lunchtime staple. Topped with half an avocado, it's filling and yummy. Again, I'm not militant here. I still pour flavored cream into my coffee, and I eat tons of fruit, which is filled with natural fructose. But I'm not eating treats. No leftover birthday cake. No Frappucinos. No squares of dark chocolate after the kids go to bed. None. Nada. I have completely lost my ability to regulate, so for this season, it's best I say no to all of it. No internal negotiations. No "but it's just a kiddie cone." Just no. Walk away. This primarily means no milk or cheese, for me. I'm still eating yogurt, usually one container a day, either with my homemade granola or in a smoothie. But cutting out milk means I'm not eating massive bowls of cereal (and this spring, I developed an affinity for Lucky Charms, so this is a good thing), and cutting out cheese means I'm not as tempted by pizza (which was practically a food group in March and April). I'm two weeks in now, and I already feel better and strangely energized. I usually have a banana, coffee and eggs for breakfast, brown rice, qunioa and avocado for lunch, and whatever I'm making my family for dinner, minus the bread and sugar. 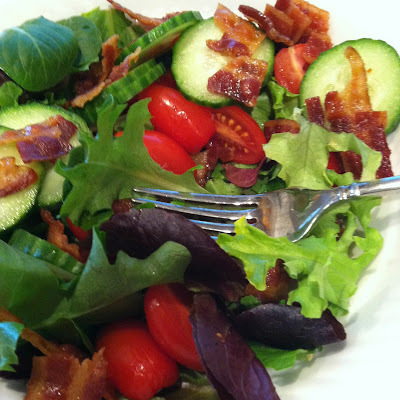 At least once a day, I have a big salad like the one pictured at the top (an improvised BLT salad, to satisfy a craving). Smoothies of frozen fruit, juice and yogurt keep my sweet tooth in check, and one night, I had a bowl of Crispix (gluten-free except for the malt flavoring) topped with almond milk and blackberries when I was getting the shakes from cereal withdrawal. It feels good to exercise some self-discipline, to not be driven by my appetites. To remember that all things are permissible, but not all things are beneficial. I suspect I'll be on this tweak-of-a-diet for a few more weeks, probably until school gets out. Just long enough for me to retrain my tastebuds and reacquaint myself with moderation. Because summer is coming and bringing with it ice cream and peach pie and s'mores. And I want to be able to enjoy those treats. And I can't enjoy something when it controls me. 1. Toss together and enjoy. 1. I'm not a huge fan of salad dressing, so I don't top this with anything. But I imagine a balsamic vinegar would be nice. 2. Do I even need to say this is customizable? I worked in newsrooms for 10 years before I had kids. I wrote about everything: local murders, a Presidential impeachment, soldiers coming home from war, the Columbine shootings, Southern California wildfires that ravaged communities. I covered it all with a tender heart and a detached mind. Tragedy happens everyday, and unfortunately, our job as journalists was to record it, often as it unfolded. Journalists are history writers, and humans are broken, and I tried not to let the bad news sink in too deep. But that was before I had babies. Before I was a mama. I doubt I could work in a newsroom today. Many of you know Corey now works for an international disaster relief and development company called Feed the Children. It happens to be headquartered in Oklahoma City, about 15 miles from Moore. 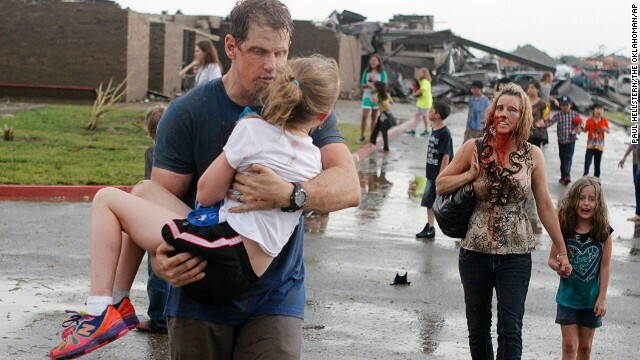 Corey isn't in the office this week, so as a mile-wide twister ripped through the homes of many of his employees, he was here in Minnesota. As you might imagine, he was glued to his computer last night, helping to mobilize the teams that will serve their own neighbors in coming days. But I know his heart is in Oklahoma this week. All our hearts are in Oklahoma this week. A friend who also works at Feed the Children wrote this prayer for Oklahoma City last night. After a day of being glued to the news, of feeling my mama's heart shatter at the mere thought of those babies in the schools as they crumbled around them, it moved me to tears. If you'd like to give to Feed the Children's tornado relief efforts, I assure you - your money will go directly to work on the ground. Five Feed the Children employees lived directly in the path of the tornado yesterday; their homes are gone. So this is personal work for the entire, dedicated staff in Oklahoma City. You can donate money here. And if you live near Oklahoma City, Feed the Children is also collecting supplies of food, diapers and water today to give to those staying in shelters. You can find the most current information about drop-off locations here. Yesterday was my 12th Mother's Day, so I knew what to expect - homemade necklaces and hand-crafted cards, extra kisses and "nuggles." I also knew what not to expect - breakfast in bed, for example, or expensive presents. After a decade of celebrations, I've fallen into a comfortable groove. The allure of holidays fade when they start to collapse under their own weight, and so often, my favorite days are the ordinary ones filled with sunshine and laughter and smoothies and late bedtimes. Mother's Day is sweet, but I'm certainly not in it for the kudos. It's like winning the lottery and demanding that someone else throw you a party. Being a mom in blessing enough. Mother's Day, to me, is a chance to fall on my knees in gratitude. To refresh my perspective on why I'm doing this and the beauty I often miss in my hurry to get to the beds made, the bodies dressed, the errands run. On Mother's Day, I determine to be more present. So yesterday, when Teyla wanted to go to church with Corey and me instead of Sunday school, I shook off the irritation and treasured her company. I held her on my lap for half the sermon and inhaled her silky hair. I accepted picture after picture emblazoned with brightly colored hearts and "Mom" and "XO XO XO." After church, I found myself studying Natalie and her changing profile. I still see my baby in there, but she's fast becoming young woman, all limbs and long hair. At bedtime, she came upstairs and offered to put Teyla to bed for me. Connor asked me repeatedly during the day if we might drive by a vending machine at some point. It wasn't until after dinner and he unloaded his pockets packed with crumpled dollars that he admitted he wanted the vending machine so he could buy me an extra present. I took a big hug from my tender-hearted boy instead. And then Kieran, at dinner, snuggled in my lap as he always does. I asked Corey to take a picture of us, and I said, half-jokingly, "Say cheese, Kieran!" because what child smiles on demand? And sure enough, instead of smiling, he turned to me and burped in my face. Then he smiled. This is motherhood. The messy, the mundane, the long hours, the unrelenting needs. But it is also pure joy, deep love, little hands that circle your neck in the most intense and sincere acceptance you've ever known. The best part? I woke up this morning determined to do it all again. After two solid weeks of crazy paced go-go-go, I found myself last night, sitting next to the bathtub, talking to Teyla and Kieran, enjoying the return to simplicity. I decided to clip their fingernails, a task that needs to be done more than I ever imagine possible, and I decided to offer a bribe to make it more palatable: Teyla, do you want me to paint your toenails? She squealed and lit up like she keeps a shaft of sunlight hidden in her soul. So I washed faces and conditioned hair and rinsed bubbles off limbs that are bigger than I think they should be, and I wrapped them in towels and started the mani-pedi. There are worse things in life than having a freshly washed three-year-old and five-year-old on your lap, wet hair in my face and giggles in my ears. I clipped and counted and even Kieran is old enough now to not freak out when the clippers touched his skin, and it all went very smoothly. Then Teyla and I, we started to ponder my fingernail polish collection, because the first toenail painting of sandal season is the time to make a statement. She chose a hot pink. I chose a pinkish lavender. Kieran chose an icy blue. He was not to be denied, my little boy with the grin and sparkle, the man-child who fights bad guys all day and then races to "nuggle" me at night. 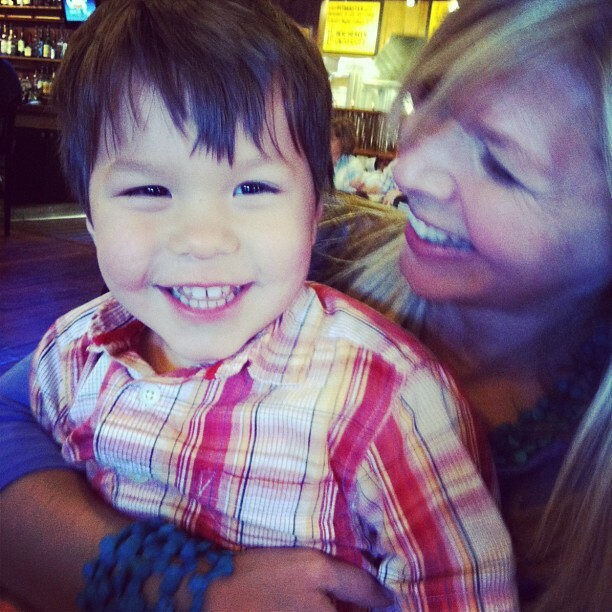 "I want blue toes, Mama," he said looking up at me with the biggest brown eyes I've ever seen. And some have sky blue toenails. This morning, Kieran climbed into bed with me before I was fully awake, and he sucked his finger and pushed right up under my heart. "My toes are blue, Mama," he said with delight. "They are so boo-tiful."